Rounding off this dual of Burberry Sports is the counterpart for Burberry Sport for Men. The women’s version is also a sporty fragrance that lacks originality and depth. But hey, it smells okay. In Bottle: Florals layered on sharp citrus and a much lighter ginger treatment than the men’s version. The florals are a bit sweet and fruity. The citrus is awfully strong which is where I guess the sport part of this fragrance is from. Applied: Nicely vibrant sweet floral citrus with that initial sharpness from the ginger. The ginger is rather fleeting in this but it does hang around and give the fragrance a bit of spiciness as the florals deepen and sweeten the longer you wear it. Burberry Sport for Women takes a turn for the sweet, creamy floral side in its mid-stage as the magnolia note amps up and makes itself quite well known. This smells sharp and clean but still very feminine. It’s a nice sporty equivalent to the men’s fragrance as the two share some similarities but are adequately unique from one another. The final dry down is a pleasant sun-warmed woodsiness with a pretty sweet and creamy floral backing. Extra: I actually like, by and large, Burberry’s fragrances. Brit was nice, The Beat is nice, Burberry London is good. And these, while unspectacular, are also good fragrances with a nice tempered sporty scent. I just think their bottle designs are rather hit or miss and so far they’ve been missing a lot. Design: Pretty much the exact same design as Burberry Sport for men only the outer casing is white instead of black. The glass bottle held within the casing is the same red as the men’s version. I still don’t like the bottle design. Notes: mandarin, ginger, marine accord, fresh magnolia, honeysuckle, petit grain, solar notes, cedar wood, musk. Again, it’s a sporty fragrance. This stuff is meant to be easily worn and meant to smell like this. I do like these two fragrances that Burberry has released though. They smell good. Not fantastic, not unique, but they are good smells that won’t be offending anyone any time soon. 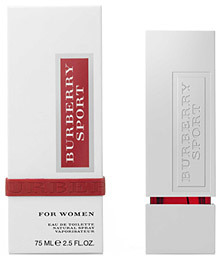 Reviewed in This Post: Burberry Sport for Women, 2010, Eau de Toilette. This entry was posted in burberry, fresh, Reviews By House and tagged cedar wood, fresh magnolia, ginger, honeysuckle, mandarin, marine accord, musk, petit grain, solar notes. Bookmark the permalink.